To navigate the website, please click on the three lines at the top left of the page. Make your appointment quickly & conveniently by using the RED BOOK NOW feature located above. 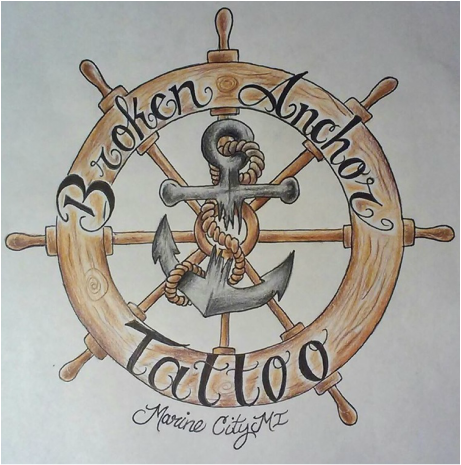 Broken Anchor is a small artist owned & operated facility. We are not corporate affiliated, therefore we can bring you great rates & personalized service! Justin has over 15 years experience in the industry. In addition, our family has resided in Marine City for the past 10 years. We offer a unique art gallery atmosphere with friendly approachable staff. Our goal is to promote local artists and their hand-crafted work, while offering a pristine & tranquil studio environment. If you're interested in displaying your artwork at the studio please use the contact form submission to contact us. *Now featuring the art of Henna Tattooing* Make an appointment with Haleigh today! It has been used for over 5000 years to decorate skin with beautiful reddish brown designs. Traditionally used in India, the Middle East, and Northern Africa for weddings and other celebrations including adorning pregnant bellies. Typically most Henna designs last 1-2 weeks, The stain fades gradually as your skin exfoliates. The time varies according to each individual. Henna tattoos are temporary, only dying or staining the top dead layers of skin. It can last anywhere between 1-3 weeks depending on its placement and care. Henna is applied starting as a paste, which then stains the skin over several hours. Application of henna involves no needles, instead henna is applied using applicator bottles, syringes (not puncturing the skin), or cones. Natural henna stains only as a reddish-brown, so beware of anything labelled as "black henna" or "colored henna".